We are 200 organizations solving big community problems by aligning partners, resources and agendas. We’ve been advocating and implementing the power of collective impact since 2014, and have been focused on advancing the health, education and financial stability of ALL individuals in Central Alabama. Most of our work happens in Blount, Jefferson, Shelby, St. Clair and Walker counties. We are convinced that social change can happen on a bigger scale when partners align across different sectors around a common agenda. We’re committed to seeking measurable results, so we share data about the community and our work in order to continuously refine and improve. By taking the long view, tying our work to measurable outcomes and helping partners align resources, we’re building a stronger future for Central Alabama. Many organizations play leadership roles in our work. 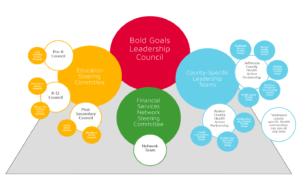 United Way of Central Alabama provides the primary staff and organizational support for the Bold Goals Coalition. You can learn more about our partners by visiting Our Work — and find a list of our partners by clicking here. Central Alabama will have 90% of high school seniors college and career-ready, and 125,000 highly skilled adults added to the workforce, by 2025. Learn more. By 2025, all Central Alabama counties will be ranked in the top 10 in Alabama for health outcomes as measured by the Robert Wood Johnson Foundation. Learn more. By 2025, serve at least 2,500 Central Alabama households through the Financial Services Network. Learn more. To learn about our project leaders, please visit Our Work.